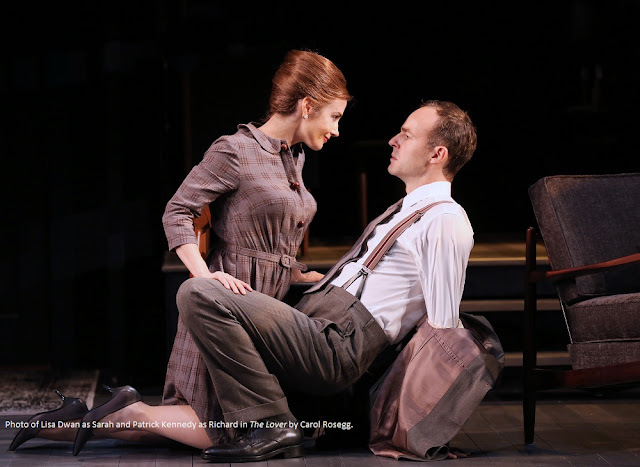 At some point prior to 2011's staging by Michael Kahn of Harold Pinter's Old Times, there may have been discussion if a playwright firmly rooted in the twentieth century was appropriate fare for a classical theatre company. Now, with Kahn launching his final season at the helm of the Shakespeare Theatre Company, he has returned to Pinter with a double bill of one acts, The Lover (1961) and The Collection (1962), surely laying any doubts to rest with one obvious truth: of course the Shakespeare Theatre should have Kahn directing Pinter, because he's so damn good at it. Kahn's strengths as a director often lie in two realms well suited to Pinter: his adherence to textual precision and nuance, and his ability to fill in the blanks of the text with meaning. Both plays keep the focus tightly on only a handful of characters, ably performed in both plays by the same ensemble: Patrick Ball, Lisa Dwan, Jack Koenig, and Patrick Kennedy. Both plays are meant to unsettle the audience, to set up expectations that are then continually reexamined and put aside. In The Lover, Dwan and Kennedy play a married couple who seem to have found balance and happiness in their lives by the casual inclusion of the wife's lover into their daily routine. In The Collection, two pairs of lovers (Dwan/Kennedy and Ball/Koenig) come into conflict over an unseen, prior meeting whose particulars remain a mystery throughout the play. 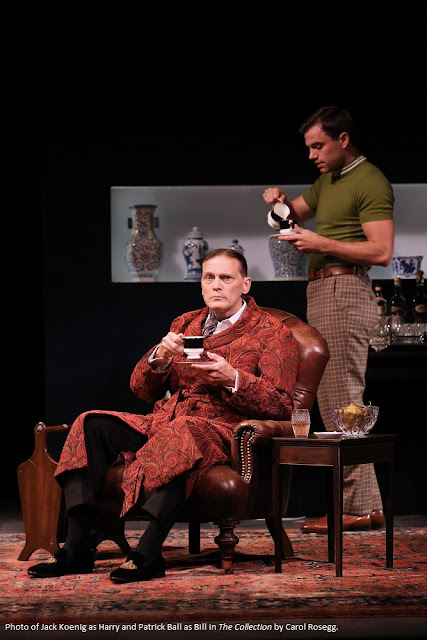 The actual plot of both plays is hardly the point; rather, it's the unsettled atmosphere that Kahn allows to brew and ferment on stage that matters most. The details don't matter as much as the conflicts exist to allow characters to reveal ugliness towards each other that still feels as transgressive today as in the early 60s. Excellent design work from Jane Greenwood grounds both plays, keeping our feet on the ground as an audience even when the playwright seeks to unmoor our expectations. Debra Booth's scenic design likewise uses some elegant shorthand to establish both locations and character. A hearty salute must go out to a mock turtleneck seen in The Collection that instantly says as much about the character and the setting than anything within the text itself (seen above), just as we see a living room designed with only one chair and a footstool for two men that says much about their relationship. I make no bones about the fact that Pinter is not to my taste, but under Kahn's direction, these two plays are bound to keep audiences riveted to every shifting tone and nuance as events unfold. Even when I most wanted to slide under my chair in frustration of stop talking around everything and for the love of god, SAY WHAT IS ACTUALLY HAPPENING RIGHT NOW, each moment is carefully orchestrated like a symphony under Kahn's baton. As much excitement as there is over the direction STC will take under a new artistic director, The Lover and The Collection are an excellent reminder of just how much the theatre community in Washington has benefitted from having Kahn at the helm of STC for so many years, and how much I'm anticipating his Hamlet still to come this season.